After reading The Strange Death of English Leg Spin, I feel a great affinity towards its author, Justin Parkinson. I would hate to suggest comparisons with my cricketing prowess in the lower reaches of club cricket but let’s just say that Justin describes himself as a useless batsman but one who took up leg spin. I, too, was a useless batsman – I seem to remember batting twelfth in a twelve-a-side game: a magnificent moment – but, given a ball and with little thought initially on how to coax a batsman out, leg breaks just happened. 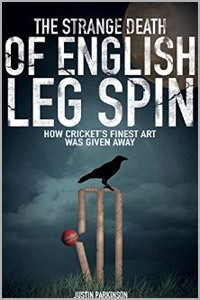 I am therefore delighted with this passionate book on how leg spin has essentially had a difficult past in England after its invention here and Justin’s research makes for a fascinating book. In essence, a history of leg spin over one hundred and thirty or more years taking in the inventor of the googly, Bernard Bosanquet, to the still active – if not currently in the England team – Scott Borthwick. I am hard pressed to remember a book devoted to just leg spin and the historical picture which Justin Parkinson paints is an invaluable asset to any cricketing library. Why is it that leg spin has been treated so suspiciously in England when, for example, Australia have produced many not merely successful but famous leg spinners? I am not just thinking of Shane Warne either. Warne, both on and off the field, has worked wonders to make this most difficult of cricketing arts popular. As Justin suggests, Warne is a one-off and many of us may feel fortunate to have watched and followed him but why have England been reluctant to breed someone similar? Rule changes have not helped. For example, after World War II ended, amidst much suffering before and after, rationing in force, rules for the County Championship were revised so that a new ball could be taken after fifty-five overs. Leather wasn’t exactly in great supply and the old English adage of “play up, play up and play the game” might have sounded good and proper but, even for the most ardent cricket fan, wasn’t it a bit too much of a luxury for the time? Justin Parkinson argues with justification that it hardly helped the leg spinner either. Who would have thought that Bob Barber, who made 185 as opener in a Test in Australia in the 1960s, was also a more than proficient leg-spinner? Many names through the ages crop up and, although the book is more about the demise – or reluctance to embrace – leg-spin in England, it acts as a very worthy and fascinating history on the subject. Some might raise their eyebrows at seeing Sydney Barnes devoted a lot of space but leg breaks - even ones bowled at 70 mph - still undoubtedly count and Barnes is still classed in the category of one of the best bowlers of all times. Earlier and later technicians of the art are analysed and the coverage given to Eric Hollies, who famously kept Don Bradman’s average to a shade under 100 with some careful planning, is especially interesting. Time will tell whether selectors read this fascinating book and decide whether this is a place for a budding leg spinner in an England Test team or whether the wait continues. Whatever, I would expect The Strange Death of English of English Leg Spin to be well received and enjoyed.